Using a new generation of catalytic converters this new technology introduces an additive into the diesel exhaust system made up of 32.5% high-purity urea with the remainder being deionised water all of which is stored in a vehicle mounted reservoir. This additive is known as AdBlue® and commonly called Diesel Exhaust Fluid (DEF) which is non-hazardous, but will stain trim, upholstery and clothing, so requires controlled refilling from special dispensing equipment, or from special non drip refill bottles. Rovertune Ltd is one of the very few Independent Specialists to have the official approved dispensing equipment, this being the only item of its kind authorised by Land Rover to meet the filling specification of its vehicles. In order for the Selective Catalytic Reduction system to work, AdBlue® levels in the vehicles special DEF tank must be maintained. AdBlue® usage levels are dependent on make of vehicle, driving style, usage, load and environmental conditions. Below is a schedule giving the approximate distance that can be travelled on a Tank of AdBlue®.It can be seen that for most vehicles one or more complete top-ups of the DEF tank will be required between recommended service intervals. The distance until the next DEF refill can be viewed at any time in the message centre on your dashboard. When critical low levels of DEF are detected in the tank several warnings will be given. The first alert occurs 1,500 miles before the tank is empty, followed by a second when 930 miles are remaining. A third warning indicates when 515 miles are left and also warns that the DEF tank needs re-filling or the vehicle will not be able re-start when the distance countdown reaches 0. The final warning indicates when only 100 miles remain. When the countdown reaches 0 miles, the vehicle will be prevented from re-starting after the next engine switch-off; this is to ensure the vehicle fully complies with current Euro 6 legislation. The engine will only start again when the DEF tank is re-filled with a minimum of 3 litres of AdBlue®. This ‘non-start’ condition is a requirement of legislation. Click here for schedule of approximate AdBlue® quantities and expected distance travelled per tank of DEF for each Land Rover vehicle. DEF quality and DEF flow rate are also monitored. 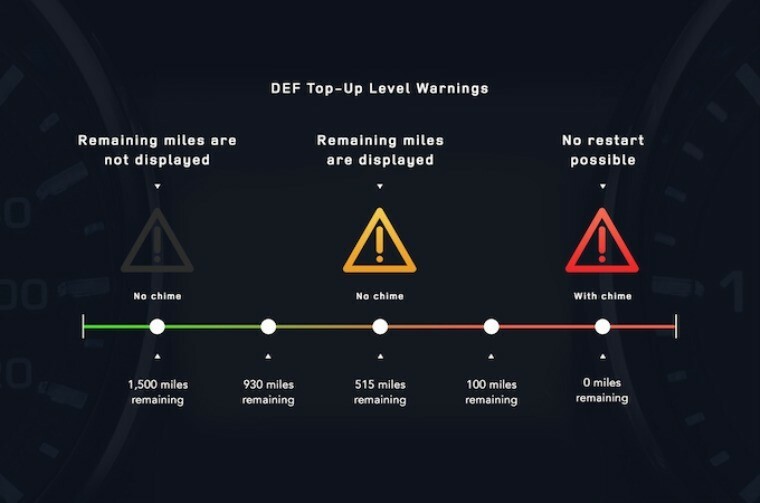 A similar warning system will notify if inferior DEF quality or a DEF system malfunction are detected, starting with a warning explaining the issue that gives the driver 530 miles to take corrective action. Once again, the car will not start if no corrective action is taken within this mileage period. You can arrange a top-up by booking an appointment at Rovertune Ltd, or just call in if levels have become very critical. There will be a standard charge of £21.00 + vat regardless of the amount of DEF required (the charge at Main Dealers is £29.99). If your vehicle is regularly serviced at Rovertune Ltd., we will top-up the DEF fluid during a routine service for the same price, regardless of the amount of fluid used. There is one very important factor to note at scheduled service intervals; if your vehicle has covered less than 15,000 miles in two years, the DEF tank must be drained and the entire contents replenished. The charge for this will be £29.99 + vat. Approximate quantities of DEF fluid are as follows; Range Rover 18 litres, Range Rover Sport 18 litres, Range Rover Evoque 14.5 litres, Discovery 4 (not 2.7 TDV6 Commercial) 17.8 litres and Discovery Sport 13.7 litres. Alternatively, if DEF levels are critically low and you cannot get to us you can top up the system yourself, to allow time to schedule a professional replenishment. Two approved AdBlue® refill bottles will be required. These can be purchased from Rovertune Ltd at £5.70 + vat per 1.89 litre bottle (Land Rover Main Dealers charge £6.57 + vat) and come with a unique splash guard filler to aid easy refills. If you purchase AdBlue® from independent auto shops, or garage forecourts, please make sure the standard you buy is ISO 22241-1 or DIN 70070. AdBlue® not complying with this specification can cause damage to the system. Commercial vehicle DEF and AdBlue® pumps on garage forecourts must not be used as the flow rate is too high and will cause damage to the reservoir. Bottled fluid without non-drip protection should also be avoided to prevent spillage (see comments in red contained within third paragraph above). DEF in non-spill containers can be stored securely on board vehicles between temperatures of -11°C and 25°C. Your vehicle owner’s handbook provides instructions on the top-up procedure. Each Land Rover model has a different entry point for DEF, so please carefully check the exact location. In the event of a problem detected with DEF quality or DEF flow rate, you should contact Rovertune Ltd, or your Land Rover Agent to resolve the issue if your vehicle is still under the manufacturer’s warranty. © Copyright 2015 Rovertune Ltd.